Tucked away under a red awning on the corner of South Allen Street and New Scotland Avenue, sits a hidden gem in the Albany community. 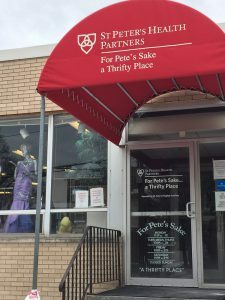 For Pete’s Sake – A Thrifty Place is the thrift store operated by St. Peter’s Hospital. Not only can you find quality clothing and household goods at low prices, you can also find something that is priceless: a sense of family, compassion, and generosity. “We have people that come back all the time. They just like coming in and talking to us,” said Norine Richardson, one of the more than two dozen volunteers who make up the store’s staff. She has been donating her time for the past 12 years. 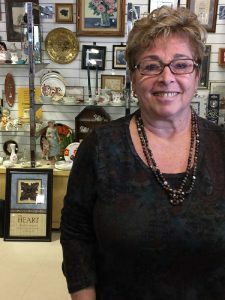 For Pete’s Sake – A Thrifty Place began as a small store for employees in the basement of St. Peter’s Hospital back in 1971. Since that time, it has tripled in size. The store celebrated its twelfth year in its current home at 583 New Scotland Avenue in May. 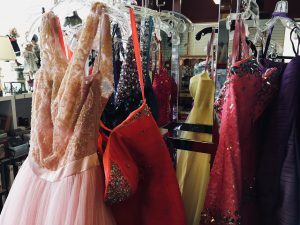 The shop offers gently used clothes, including many high-end labels, and even prom dresses and tuxedos. If you are looking for household items like kitchen utensils, plates, or glasses, they have those, too. “We’re accessible. I always say, come here first before you go to the mall,” Richardson said. While the store is open to the community, its main mission is serving the patients of St. Peter’s Hospital. More often than not, that means helping someone in need. A program led by the Office of Volunteer Services at St. Peter’s Hospital, enables social workers, nurses, and information associates to provide vouchers for the store to patients in need. The vouchers, provided in increments of $5, allow these patients to purchase essential items following a hospital stay. This compassion and respect for patients exemplifies St. Peter’s Health Partners’ commitment to reverence and standing with those who are most vulnerable, Norris said. Barbette Davis, a patient care technician at St. Peter’s Hospital, has handed out dozens of the vouchers. “Clean clothes is one of those most basic, confidence boosting items that the patients may need to move forward with their recovery,” said Megan Spagnola, a behavioral health counselor at St. Peter’s Hospital. Spagnola and Kirsch agree: the voucher system has made, and continues to make, a real difference in the lives of St. Peter’s Hospital patients. “We can go over there with a couple of vouchers and send someone to a program, or back home with enough clothing to make them comfortable for a couple of weeks, which is really great,” said Spagnola. Operated by the St. Peter’s Auxiliary, For Pete’s Sake – A Thrifty Place, funnels all of its revenue to hospital projects, including the Vials for Life program, as well as other programs supporting breast cancer patients and new mothers. St. Peter’s Hospital is part of St. Peter’s Health Partners, a member of Trinity Health.